tags: Daring PRIVATEER Meets Notorious LADY PIRATE! The seafaring adventures of French privateer Kit 'The Hawk' Gerardo during the Franco-Spanish-English war of the 17th century. Kit Gerardo, also known as The Hawk, is one of Frances's most daring privateers, rescues Rouge from a Spanish ship. She is also a pirate, working to restore the fortune the French took from her. When Kit is captured by the governor of Cartagena, Luis del Toro, Rouge demands that he be hanged for piracy. Only one person knows it, but Kit is the governor's son. When I saw that Sam Katzman was the producer of THE GOLDEN HAWK, I really wasn't expecting much, given his reputation for turning out dozens of low-budget potboilers during his long career. In 1952 alone, the year of this film's release, he produced nine features (five of them in color) and three 15-chapter serials. Yet I was pleasantly surprised by THE GOLDEN HAWK. It had a much more intricate story than usual for Katzman's pirate "epics," boasted much better production values, and offered a more high-powered pair of leads—Sterling Hayden and Rhonda Fleming--than we usually got from him. I'm guessing that Katzman lavished more care on this because the source material—a best-seller by prominent historical novelist Frank Yerby—was more prestigious than anything he usually had to work with. Only one previous Yerby novel had resulted in a screen adaptation—THE FOXES OF HARROW, a lavish 1948 historical drama from 20th Century Fox which starred Rex Harrison and Maureen O'Hara—and only one subsequent work was adapted—THE SARACEN BLADE (1954), also produced by Katzman. I was especially taken with Rhonda Fleming's character, who has more than one name in the course of the film, given the multiple identities she takes on. We see her most often as "Rouge," a notorious English pirate queen who is frequently at odds with the hero of the piece, French privateer Kit Gerardo (Hayden), despite the fact that they're in love with each other. She even shoots him at one point when he enters her bedroom and looms over her in her sleep. (It isn't what she thinks it is, but how was she supposed to know that?) Fleming has a dramatic scene where she lambastes Gerardo and his pirate crew for pillaging the land she'd successfully developed into a Caribbean plantation under a new identity during a long absence from the narrative. A bigger-budget Hollywood historical drama might have focused more on her character and the turn of events that created the plantation. Helena Carter (INVADERS FROM MARS) is quite good as Bianca de Valdiva, a Spanish lady who falls for Gerardo but winds up marrying his chief nemesis, Captain Luis del Toro (John Sutton), a Spanish officer charged with ridding the region of French pirates and privateers. Carter has a regal quality about her as she deals with each of the characters in turn and sizes them up properly before deciding what course of action is best for her. She and Fleming have a heart-to-heart talk late in the film that's actually quite moving. It's the kind of thing we don't see often from women characters in these types of genre films. John Sutton as the Spanish captain is not the cardboard villain he was in so many of these films (e.g. CAPTAIN PIRATE, SANGAREE), but a fair-minded man with secret knowledge about Gerardo that invokes a compassionate response. Hayden's pirate team consists of Paul Cavanaugh, Michael Ansara, and Raymond Hatton, and all three actors are in the film from beginning to end and seem to be having the time of their lives. Cavanaugh was 63 when he made this and Hatton was 64 (and usually playing old coots in westerns by this point), yet the characters are quite vigorous and the two performers engage in a lot of physical action. Speaking of which, Fleming and Hayden perform a lot of action as well. Hayden seems to do all of his own swordfighting in a duel early on with Cavanaugh (who's doubled in much of the scene), while Fleming does a swimming scene that looks pretty rigorous. There is a climactic battle between the French fleet at sea and the Spanish fortress at Cartagena which is pretty spectacular for a sequence chiefly involving miniatures and studio sets. I can't vouch for the historical accuracy of the film, only for its entertainment value as a mid-range studio genre film with colorful sets and costumes, plenty of action, a fast pace, intriguing characters and lively, energetic performers. If there is one false note, it's the sequence set on a South Seas Island with Polynesian dancers and natives, including one veteran Hawaiian actor on hand, Al Kikume (Chief Mehevi in John Ford's THE HURRICANE, 1937). I thought this movie was set in the Caribbean, halfway around the world from Polynesia. Unless Hayden and his crew took a trip there on some business and just didn't tell the movie audience where they were going. Actor Sterling Hayden made his screen debut in 1941 in two adventure type of films "Virginia" and "Bahama Passage" and became the heart throb of many teenage girls. He soon became disgusted with the movie industry and joined the United States Marines and became a member of the OSS. Hayden may well have been a real life adventurer but was poorly miscast as a vengeful pirate in this Peyton Place On The High Seas "B" Movie wannabe epic. What this movie has going for it is; 1) Glorious Technicolor 2) The gorgeous Rhonda Flemming 3) a solid veteran character cast 4) beautiful sets and scenery. Having said that, the plot is so horrid that it is almost laughable. I don't know whether to blame Frank Yerby, the author of "The Golden Hawk" or the director Sidney Salkow for the terribly miscast lead. 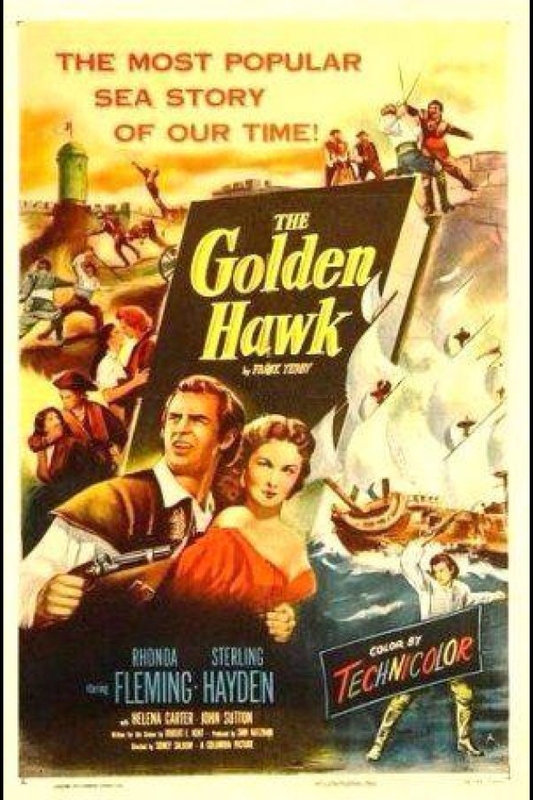 Kit Gerardo aka The Hawk (Sterling Hayden) is a French Pirate that sets out to revenge the death of his mother. He believes the culprit is none other than the Spanish Captain Luis del Toro (John Sutton). During The Hawk's pursuit of the evil Luis del Toro he winds up capturing i.e., rescuing two beautiful women. One is a lady turned pirate named Captain Rouge (Rhonda Fleming) and the other is Blanca de Valdiva (Helen Carter). Complications arise when Blanca de Valdiva finds herself in a situation where she is engaged to Luis del Toro, and at the same time hopelessly in love with his arch rival, The Hawk. Blanca's love for The Hawk is not reciprocated for The Hawk has become smitten with Captain Rouge (Fleming). More complications follow as The Hawk unknowingly burns down Captain Rouge's Plantation in an effort to destroy his nemeses Luis del Toro supply line. Now Captain Rouge finds herself in a position of hating the man she really loves. Apparently, Captain Rouge was a lady that had lost her family's Plantation many years ago and has turned pirate to get it back. Confusing? You bet! It gets even more confusing with a twist that will end all twist in the closing scenes. Unfortunately, the ironic twist that is to come is almost like a "we'e running out of film...we better wrap things up" type of thing. Near the end of the film Captain Rouge (Fleming) rescues The Hawk and Bernardo Diaz (Michael Ansara) from prison. Upon his release The Hawk orders Captain Rouge to have his men fire on the fortress. The lady pirate confirms the fact that she now realizes that she loves The Hawk with a submissive, "I never thought I would be taking orders from a man!" Pirate ships now surround the fortress and blow down it's impregnable walls. The audience is soon hit with the zinger to end all zingers when Luis del Toro (Sutton) now a captive of The Hawk says, "You show great concern for your prisoner, Captain." The Hawk responds, "I should show great concern for my father." Ah, now the audience realizes why Sutton has been so reluctant to punish his son, Hayden. As they explain away the death of The Hawk's mother as an accident, I am left wondering why did they kill so many people over such a big misunderstanding or more importantly "Why does the son look as old as the father?"